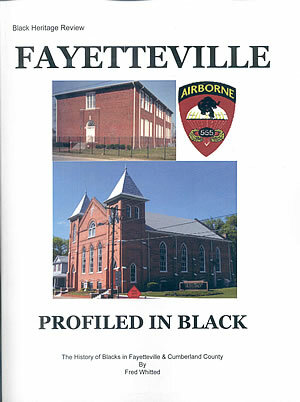 The original FAYETTEVILLE: Profiled in Black was published in 2010. This was the first narrative history of the Black communities of Fayetteville and Cumberland County. It documented a much of the untold story of this community. At the same time, it was understood that, at some point, there was much more to be told. Well, the time has come for the sequel to the first edition of FAYETTEVILLE: Profiled in Black. FAYETTEVILLE: Profiled in Black-Volume Two will be released September 9, 2014. The new book will contain nearly as many pages, and, will have 75 percent new materials. We will repeat part of the core history along with an extended time-line. Profiles of a few people and organizations will be updated to reflect advance in their careers or retirements. In addition to the research that our team is doing, we are also asking for help from the public in identifying persons who should be included. We welcome biographic materials from the public on member of their families, outstanding persons from their neighborhood and churches. Another twist to this edition will be a stronger focus on families and communities. One of our aims is to highlight each major neighborhood within the Black community of the city and county. You may feel free to submit stories about your community, along with stories about those who helped to make it home for you. We want to profile your schools, churches, and businesses, along with those who helped to make it the community that you loved. Sponsorship Opportunities are outlined here. Because we will be heavily involved with Black college athletics during the fall, we will only be pre-selling Volume-Two. Beginning May 14, 2014 through August 1, 2014, the book will be offered for sale online and through designated sites. To order online, click on the button below.To obtain an order form, click here.